Ninety percent of suicides are the result of a diagnosable mental illness, experts say. The three leading disorders that cause suicide are: bipolar disorder and depression, alcohol abuse, and schizophrenia, said Firestone, who noted that nearly 50 percent of suicides occur under the influence of alcohol. “What we’re finding as well is that people are relying more heavily on drug treatments for suicide and less on psychotherapy, and I don’t think suicide can be treated solely by drugs,” said Firestone. Triggers of suicide can vary depending on age, said David Castro-Blanco, a professor at the Adler School of Professional Psychology in Chicago. Bullying, for instance, is a common driver of teen suicide, but is not as relevant in adults. The elderly are the fastest-growing group by age in terms of suicide, said Castro-Blanco. The contributors to this rise, which he suspects are also related to economic downturn, are certainly worth investigating, he said. Suicide is also on the rise is in the military. Since 2010, more military servicemen have committed suicide than died in combat. 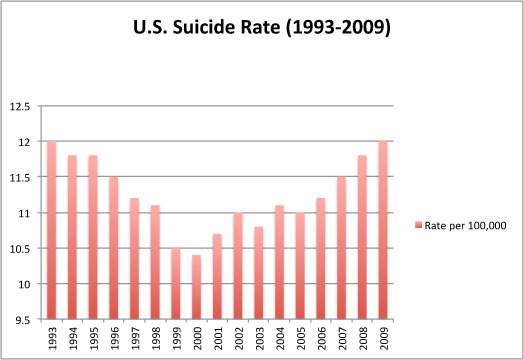 via Economic hardship causes suicide-rate increase, experts speculate. This entry was posted in Suicide and tagged suicide rate up. Bookmark the permalink. My grandmother committed suicide when my father was 14. He found her. He thought it was probably from mental illness. His four years-older sister had a different perspective, knowing that she was the daughter of an abusive alcoholic and when the family moved away from her large extended family she could not cope. Her three children watched helplessly as she descended into depression, but a caring father gave them the strength and confidence to cope.